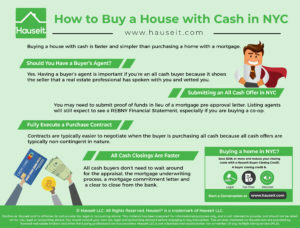 Buying a house with cash is faster and simpler than purchasing a home with a mortgage. All cash buyers won’t have to deal with the loan approval process and can often close in under 30 days vs 60 to 90 days if financing. 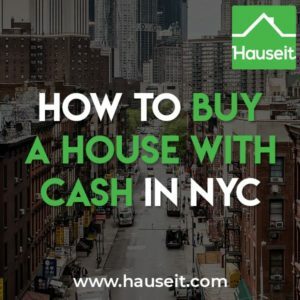 We’ll show you step by step how to buy a house with cash in NYC in this article. Should You Have a Buyer’s Agent? Yes. Having a buyer’s agent is important if you’re an all cash buyer because it shows that a real estate professional has spoken with you and vetted you. Buyer’s agents are very good at detecting whether someone is serious or real, and it’ll be comforting for sellers to know that you’ve passed the sniff test. Furthermore, a buyer’s agent doesn’t cost you anything as the buyer. Sellers always pay the commission which is fixed in the listing agreement before the property even comes on market. This commission is split equally between a buyer’s agent and a listing agent. If the buyer doesn’t have an agent, the listing agent keeps both sides of the commission. As a result, it’d be silly for you to pass up the opportunity for free guidance and representation from your own buyer’s agent. Most buyers understand that having a buyer’s agent is akin to using it or losing it, and as a result over 90% of buyers end up being represented by their own agent in NYC. Pro Tip: How much money do I need to buy an apartment in NYC? Concerned about closing costs and post-closing liquidity? 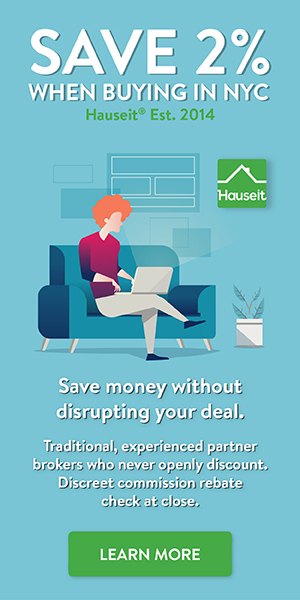 Check out our handy NYC Buyer Closing Cost Calculator to estimate what you’ll owe at closing, and learn how you can save $20,000 or more on your purchase with a buyer closing credit. Once you find a great real estate agent and he or she has found you the perfect home, it’s time to submit an offer. Please remember that you can submit offers on multiple properties, and you can even negotiate multiple contracts on multiple accepted offers. That’s because real estate offers are not binding in NYC, and these offers are made of air until contracts are signed. Some buyers who are keen on privacy may try to get away without providing the REBNY Financial Statement. However, listing agents for both condos, co-ops and houses will expect to see this even if you’re purchasing all cash. Co-op listing agents have a legitimate need to see this because co-ops will have their own set of coop financial requirements and post-closing liquidity requirements. For example, just because you can buy a coop apartment for all cash does not mean you have much liquid assets left over to meet a coop’s post-closing liquidity requirements. Pro Tip: Inexperienced sellers may naively agree to move forward with an accepted offer without seeing proof of funds or a REBNY Financial Statement. However, this is not advised for sellers as the last thing you want is to waste time dealing with an unqualified buyer or someone who is outright lying about their financial resources. Contracts are typically easier to negotiate when the buyer is purchasing all cash. That’s because all cash offers are typically non-contingent in nature. The most common contingency in NYC is the financing contingency which wouldn’t apply for a cash buyer. As a result, the purchase contract and the contract rider are typically easier and faster to negotiate. While your lawyer is negotiating the contract with the seller’s attorney, your lawyer will begin conducting legal and financial due diligence on your behalf. You should also order a home inspection at this stage, especially if you are buying free-standing property such as a single or multi-family house. Your lawyer will order a title search and possibly a survey report if you are buying free-standing property. If you are buying a co-op or a condo apartment, your lawyer will review the building’s original offering plan, the building’s financial statements and budget, any amendments to the original offering plan, as well as the board meeting minutes. Once everything is reviewed to your attorney’s satisfaction, you will meet with your lawyer to go over everything before you sign the contract and hand over the contract deposit. The contract deposit in NYC is typically a personal check worth 10% of the contract price. Once signed, your attorney will messenger or overnight the signed contract and the contract deposit over to the seller’s attorney. Once the seller counter-signs, the seller’s attorney will deposit the contract deposit into escrow and return the fully executed contract to the buyer’s attorney. At this point, you have a fully executed contract and the listing is officially in contract. One of the main benefits of accepting a cash offer on a house in NYC for sellers is that closings can happen a lot faster. All cash buyers don’t need to wait around for the appraisal, the mortgage underwriting process, a mortgage commitment letter and a clear to close from the bank. 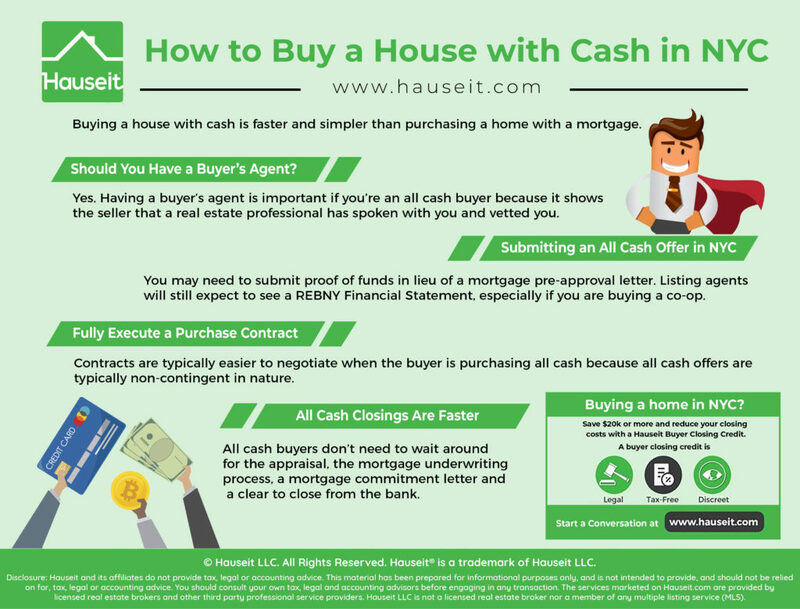 We truly think the reason buyers ask how to buy a house with cash in NYC is because of the complexity they’re used to when it comes to buying a home with a mortgage. When you remove the layer of complexity that comes from the bank, the offer to closing process is much simpler. The closing process is even easier if you are buying a house with cash vs a co-op or condo apartment. That’s because you also won’t have to deal with any sort of purchase application, right of first refusal or co-op board approval process. So what is there when it comes to closing on a house if you’re buying all cash? Well, once you have a satisfactory home inspection and title report, and your lawyer has negotiated the contract to satisfaction and you have signed, there’s really nothing more to it except for the lawyers on both sides to arrange a closing date. The closing will typically be held at the seller’s attorney’s office, or the buyer’s attorney’s office is the latter has an office that is more centrally located. At the closing, you can expect to see the buyer, the seller, the buyer’s attorney, the seller’s attorney, a representative from the title company as well as the buyer’s broker and the seller’s broker. Note that the brokers typically don’t show up to closing in New York because they don’t have a role to play at this final meeting, and there often aren’t enough seats for them even if they wanted to join. As a result, brokers typically show up at a later time to pick up their commission checks. Pro Tip: Read our guide on how much time is there between offer and closing in NYC to learn more. And before you get any further, make sure to ask yourself, is buying an apartment in NYC a good investment?